Spalding Gray discusses his experiences while filming a small role in The Killing Fields (1984). 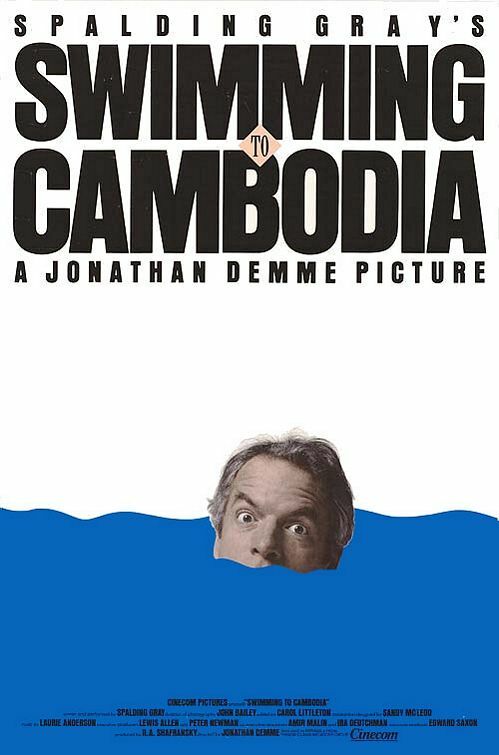 Spalding Gray is one of the best-known monologists of the late 20th century, and Jonathan Demme’s Swimming to Cambodia — an edited combination of two live performances, accompanied by Laurie Anderson’s evocative sound effects — provides a fascinating glimpse at his prowess. In this unusual storytelling event, Gray intersperses humorous vignettes from his experiences filming in Thailand with a concise history of the brutal Khmer Rouge regime in Cambodia — an unexpected, yet surprisingly effective, marriage of ideas. Gray’s monologue is poignant rather than hilarious; he’s not a stand-up comedian, but rather an astute commentator on the intersection of personal travails and public tragedies. Yes. All film fanatics should see at least one of the late Spalding Gray’s filmed monologues, and this is probably his best. For the ff, ‘STC’ is the rare example of an extended, filmed monologue – which, being a theater performance, obviously has a dynamic quite different from that of stand-up. I doubt I would ever call filmed stand-up a film. Demme has taken a simple, direct approach in serving up the material, and he serves it well. The informative, historical tale Gray has to impart is largely that of a hell on earth, in its various forms. His manner is lively, to say the least.